The third CD from California's Avenged Sevenfold is a quantum leap forward in maturity and song composition. The CD delivers a uniformly consistent set of melodic heavy metal, with terrific, complex and layered arrangements that do not detract from the pure power of the music. On vocals, M. Shadows departs for the first time from screaming to actual singing, and does it really well. As a singer he does have similarities with Axl Rose, and along with the overall punk-ethic-but-pure-sound of the CD, there are more than passing similarities here to Appetite for Destruction -- but this is all a good thing. Any band that can capture even a vague resemblance to one of heavy metal's greatest-ever recordings is doing something right. This is probably most evident on the memorable power-ballad Seize the Day, where Shadows is Axl, and Synyster Gates' solo evokes Slash at his most soulful. Continuing the comparison, Beast and the Harlot is one of the greatest CD openers since Welcome to the Jungle. 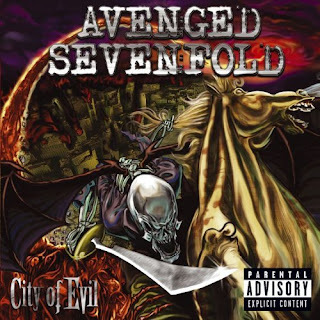 It sets the stage for a strong songlist on City of Evil, more than 70 minutes that never descend into filler material. Even the slightly weaker tracks have strong redeeming features, like the terrific flamenco-inspired guitar work that concludes Sidewinder. Gates and Zacky Vengeance deliver memorable guitar work and lead riffs on almost every song, while the rhythm section of Johnny Christ on bass and The Rev on drums provide a strong but unobtrusive foundation. There are multiple harmonies, speed changes, stop-starts, orchestral sounds, and complex melodies melding into each other, all within an envelope of unmistakeably pure heavy metal. Standout tracks include Bat Country, Trashed and Scattered, and the epic Strength of the World, which opens with a great evocation of Spaghetti Western theme music. City of Evil establishes itself as a cornerstone in the heavy metal sound of the 2000's.